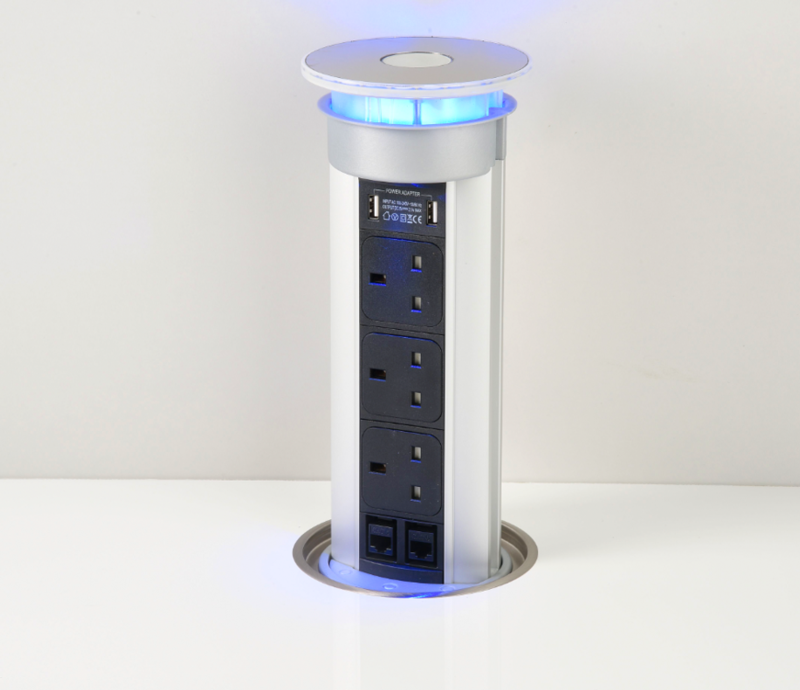 100mm Diameter Pop Up Power Unit with 3x UK Power Sockets & 2 Cat 6 Data Ports. This particular unit has the added feature of USB and LED. Just peel back the protective film and drop it in a predrilled hole ready to go. Supplied with standard 2 metre leads and fitted plug for any UK Standard 3 pin system - just like a deluxe extension socket! The Matt Chrome Top Disc compliments the Silver surround and you just depress the white button to 'pop-up' the unit about 25-30mm - and then draw it into position. Adds that real wow factor to any kitchen, especially when used in conjunction with the flush fit adaptor ring - requires 124mm hole.